New Way® Salutes Those Who "Drive the Difference"
Above: Mike McLaughlin (left) & Phil Allen (right) present Dave Short (Center), West Coast Regional Sales Manager with this Year's Driving the Difference Award. Las Vegas, NV - The 2009 Waste Expo had many highlights, including the unveiling of New Way®’s latest product, the automated side loading refuse truck, aptly named the “Sidewinder”. It also marked CEO, John McLaughlin’s induction into the Environmental Industry Associations (EIA) Hall of Fame. 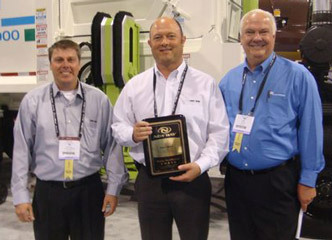 New Way®’s West Coast Regional Sales Manager, Dave Short, was awarded this year's “Driving the Difference Award” for his significant efforts for New Way® in 2008. 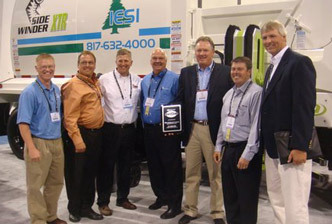 Elliott Equipment Co., based in Davenport, Iowa, was honored as New Way®’s “2008 Dealer of the Year Award”, for outstanding sales and continual promotion of New Way® Trucks.